Although Acer still produces the Aspire X series of compact desktop systems, the Aspire X3300 model has been discontinued for many years and is probably not even found in the used PC market anymore. If you are looking for a small desktop computer, check out the list of Best Small Form Factor PCs for more current options. March 2, 2010 - Acer's Aspire X3300 is a very affordable slim desktop system at just $500 but the system is a series of tradeoffs that will work for some but not others. The terabyte hard drive is certainly welcome for those that need a lot of space for media files and programs. Performance is decent for the cost although new Core i3 dual-core systems do outperform the quad-core Athlon II X4. This system is best used as a low-cost general purpose system for those that don't want a large desktop. 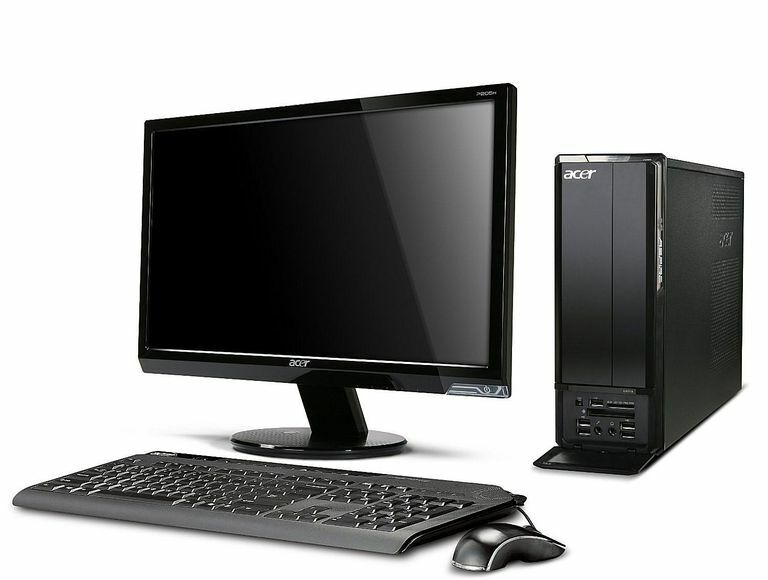 13.9" x 3.9" x 10.4"
Acer's X series small desktop systems were previously based around Intel parts. With the new Aspire X3300, Acer has decided to switch to the AMD processor platform which helps keep costs down. Unfortunately, it doesn't help the system's overall performance. The Athlon II X4 620 processor has four cores and runs decently well but it is overshadowed by the Core i3 dual-core processors from Intel that can do more with fewer cores. Even though the Aspire X3300 is a budget system, Acer didn't skimp when it comes to storage features. It uses a large one terabyte hard drive that provides a large amount of space for programs and data. This is very useful for those with very large media file collections and it is also larger than most small form factor desktops that favor smaller drives. It uses a green series drive with a variable spin rate to reduce power consumption that can impact performance at times but it should still work for things like media streaming. They also include an eSATA port for use with high-speed external storage peripherals. Graphics is another area where the Aspire X3300 could really use some work. It uses a dedicated NVIDIA GeForce 9200 graphics processor. Now, this is a step up from Intel's solutions but it still lacks any significant 3D performance. Don't expect to be using this system for gaming beyond low detail levels at low to moderate resolutions. There is a PCI-Express graphics slot in the system but it is a low profile slot and a small 220W power supply that severely limits what can be installed in it. Those who do elect to buy the Aspire X3300 should be prepared to spend a fair amount of time cleaning up the operating system. Acer installs a fair amount of trialware applications onto the system that clutters up the desktop and state menu. While Windows 7 doesn't take as much of a performance hit as Vista did it is still annoying to have to deal with the various programs that you likely will not use. So, is the Acer Aspire X3300 worth considering? If you want a relatively small desktop class system for general purpose computing then it is probably fine. If you might be using it for gaming or heavy-duty computing tasks, then there are some better options for just a bit more money.